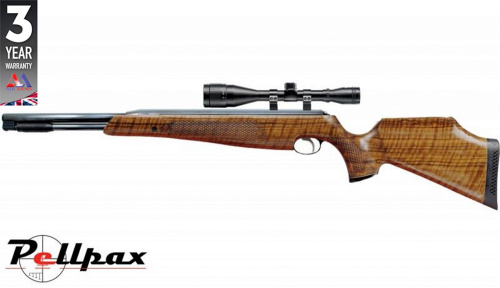 The Air Arms TX200 MK3 has championship winning blood flowing through its veins and, in the right hands, is one of the best performing spring rifles on the market today. The main spring and piston system glides over specially designed synthetic bearings that reduces friction for a smooth and long lasting performance. The Lothar Walther barrel is makes to an exceptional standard with precise rifling that delivers time after time. This reduced friction also means better efficiency and easier cocking. With its high accuracy and formidable power, the TX200 is ideally suited both target shooting and vermin control and provides match grade precision without the need for extranal bottles or CO2 capsules, the power is always there. The stock of the TX200 is made from walnut that has been chosen for its patterning and also its strength. The fish scale detailing has been laser etched and enhances grip as well as finishing off the look of this already handsome rifle.